Story: The 21st James Bond adventure in the most successful franchise in film history stars Daniel Craig in his debut as 007 and is based on Ian Fleming's first novel to feature the ultimate secret agent, which was published in 1953. The story traces the early career of James Bond. His first "007" mission leads him to Le Chiffre, banker to the world's terrorists. 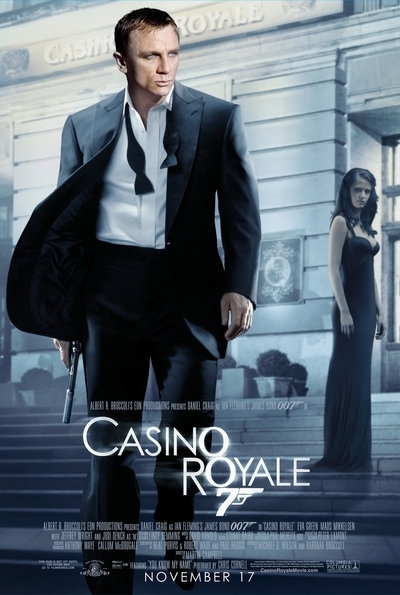 In order to stop him and bring down the terrorist network, Bond must beat Le Chiffre in a high-stakes poker game at Casino Royale. Bond is initially annoyed when a beautiful Treasury official, Vesper Lynd, is assigned to deliver his stake for the game and watch over the government's money. But as Bond and Vesper survive a series of lethal attacks by Le Chiffre and his henchmen, a mutual attraction develops, leading them both into further danger and events that will shape Bond's life forever. Featured in the film is the new Aston Martin DBS (in a special color, Casino Ice, not available until 2007) alongside the Bond favorite Aston Martin DB5. And finally, Bond reveals the recipe for his favorite martini, "The Vesper."